Lately, I've been shopping without my boy Friday(Aki). So, without him there to distract the Sales associates, it's been impossible for me to take pictures of the immaculate beauty counters. Tonight, we were at LakeTown, and with no SA in sight, I seized the moment and took a photo of my favorite store in the entire mall, Cosmeme. 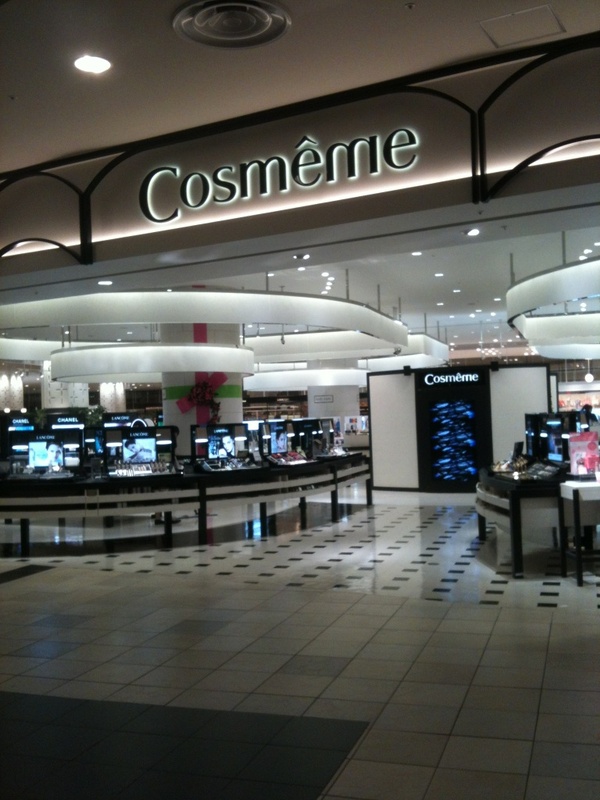 Cosmeme offers a small range of high-end brands such as Dior, Chanel, Yves Saint Laurent, Lancome, Helena Rubinstein, Shu Uemura, Clinique, and, now, Addiction. The main reason I love shopping at Cosmeme is their member's card. Out of all the beauty member"s cards I have (and I have all of them), Cosmeme's is the only one that actually awards you with cash back. After you've accrued a certain amount of points, you get ¥1,000 yen off your purchase. Yay for cash back! What stores give you cash back rewards? It is Laura! I love the fact that the Sa's leave you alone to shop in peace. I think Sephora offered a $20 certificate to VIB customers before the holidays last year. In addition, they actually do a sale twice a year. Right now they are offering 15% off AND you can use it as many times as you want. That's something you'll never see at the dept. stores. When they run specials, cosmetics are always excluded. What good is a sale if they exclude cosmetics? I too find it annoying when cosmetics is excluded from department store sales. A few years back, I'm not sure if it was Saks or neiman's, but I was able to get 10% off my cosmetics purchase during their friends & family sale. Wow looks a makeup lover's heaven! I would like to visit this sometime if I can ever find a tour guide to distract the sales... as I heard that they can be a bit persistent!